I'll start out with this: Marketing is one of the hardest things about being a self-published author. There's a fine line between not doing enough and doing too much and different readers (and authors) have different burn out points where they'll "unfollow" or "unfriend." However, there are some mistakes I see repeatedly that are actually pretty easy to avoid, so I thought I'd make a quick list. I may have done some of these in the beginning. Most aren't going to ruin you, but they also won't necessarily help you, and they can use up your energy which could be much better spent writing new books. Marketing doesn't have to be all consuming. 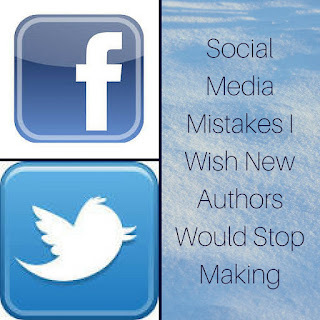 These are some ways new authors often make it harder than it has to be (or harder for their followers than it has to be). 1. Making a new profile for every single book. I think this happens because of a misconception that it takes one book to "make it." All you need is one best seller, right? Or maybe the author assumes that their creative energy was all expended in that one single book ... so they make a social media profile and instead of naming it after their author name, they name it after their book (or a main character in their book because that seems like a creative marketing tool, right?). They put all their energy into getting followers for that book (or sometimes a series), but then a year later, they have another book ... so they make a new social media profile for that book. They beg all their followers from the first profile to also follow their second profile ... and sometimes the followers oblige, sometimes they don't. If they are a prolific author, this can get really annoying really fast. There's a limit to how many social media accounts I want to follow per friend, personally. It also makes it a lot more work because you have to try and keep each account active or else, what's the point? It's much easier to use your author name (pen or otherwise), make one page, and then you can market all your books from one place. This takes less time and makes it easier for readers to find more content from you. Now the "social media account run by a character" can be kind of cool and doable ... but I'd only suggest this if you ALSO have an author profile and have the time needed to successfully run both pages. Remember, time spent marketing is time spent not writing. You do need to do both, but don't take on more than you can handle. 2. Using a "personal profile" rather than a "page." 1. Most people keep business and personal separate for a reason. If you have never had a personal profile on said site and are planning to keep your page completely business, great, but if this personal profile is also where you talk about your day, your kids, and what you eat for dinner ... you're probably going to bore readers. You risk becoming a victim of social engineering scams as people find out stuff about you, and it ups your chances of being trolled because you've let readers get very close ... it's nice to build a relationship with anyone you do business with, but if you wouldn't invite someone into your house, you probably shouldn't invite them to your personal profile. 2. A lot of readers don't want to "friend" you because friending goes both ways. Once you friend an author, not only can you see the author's pages and pictures, but the author can see yours. The reader may be uncomfortable with this. Now there is an option to "follow" a personal page, but many readers prefer the simplicity of the "like this page" system, and I'm not sure if you'll necessarily get the exposure you want this way. 3. A lot of authors use double accounts to create a "personal" page for their author persona while still maintaining a "real" personal page for themselves. Seems slick and easy, right? Totally against Facebook's rules at this time and can get your accounts shut down, in which case you lose your followers. Now a lot of writers (and other business personas) do get away with this because Facebook is really inconsistent about what rules they enforce and when ... however, all it takes is one vindictive person getting it into their head to report you, and KABLAM! It all blows up in your face and you end up having to basically start from scratch. You can use different email addresses and programs that mask your ip address to maintain the charade of being two separate people rather than one maintaining two accounts, but it really doesn't make sense to build your presence on a social media platform while actively breaking said platform's rules. Note: this really only applies to Facebook. Most other social media sites lack Facebook's strict division between personal and business and are less "up in your business" about it. This may be why a lot of brands/authors/businesses are switching their focus to other sites. 3. Advertising instead of interacting. A lot of authors simply don't know what to do online besides spam links, copy reviews, and make ads. However, most readers do not necessarily want to see ads. You need to have a decent ratio of content to advertising or else people unfollow pretty quickly. My least favorite is when I follow an author and immediately get an automated message advertising their latest book or begging me to download something or follow a second account. It's a major turn off ... though wait .. that's my second to least favorite ... my LEAST LEAST favorite is when the author follows me and when I return the favor they immediately send me an advertisement. To me that spells total disinterest in me as a person rather than as a potential customer. 1. Following a BUNCH of accounts then posting on their walls begging for reciprocity or posting advertisements on the Facebook wall of the author you just followed. 2. Joining forums or groups to post about your book and then leaving never to be seen or heard from again ... (note, Facebook has some groups that are specifically for post and run advertisements ... I'm not sure how effective they are, but they at least won't tick people off when you use them as intended). 3. Hijacking unrelated discussions to talk about your book. So basically, you have to earn your right to sell to people. Try to post something people will like (funny pictures, jokes, samples from your work in progress ... content) and then, after you've given them a reason to hang out with you, share a link. Also, you should have you account set up so that people can see where your books are available just by clicking on it. You shouldn't have to message people to let them know. The information should just be there (in your profile description ... in your pinned post ... etc). 4. Spreading yourself too thin. I think a lot of the reason authors get overwhelmed with social media is because of the over-abundance of options. It seems like every few months someone somewhere rolls out "the next big thing" and if you don't jump on that, you'll be a rotten egg or something ... however, it is very very hard to be active on so many social media outlets without it becoming a full time job. There are some options to automate (or to simul-post to multiple pages at once ... like post to your blog, immediately click the links beneath the post to share on Facebook, Twitter, and G+. Use Roundteam to follow certain hashtags on Twitter. Schedule all your posts a head of time on Facebook and have them go out automatically while you are sleeping), but generally speaking, I'd pick two or three social media streams to focus on while sort of just setting up the rest and letting them link to your more active ones so people can "find you" but don't stress if you don't do a lot there. 1. Find out where your readers are. It's good to know your target demographic anyway, and you can find breakdowns of what ages and genders are most active on which social media channels just with a little google searching. 2. Do the ones you can do well. If you are good at something, if you find it easier to interact in a specific format (like pictures on Instagram, quick quips on Twitter, or sharing funny stories on Facebook), then nurture that. Don't force yourself to interact in a way that doesn't come naturally. Take the road that fits your style the best. 3. Do the ones you enjoy. I am on Pinterest not because I necessarily see sales results from Pinterest, but because I can find pictures of dragons and cats wearing top hats there. Fortunately, a lot of my readers like dragons and cats wearing top hats. 5. Neglecting basic set up. Not using shortlinks. It seems a simple thing, but too many authors copy the whole dang search bar for their book's Amazon product page. It looks messy and takes up a lot of the character limit in a tweet. You can use sites like bit.ly and booklinker.net to create shortlinks for you tweets. Not setting up an Author Central or Goodreads page. It takes a few minutes and it helps readers find you and your books. Also, double check that all your books are linked to your profiles correctly. Not setting up a mailing list. These take time to build and nurture, but when the earlier you start building an email list the better. You can use mailchimp or similar free programs. So those are just some basic things you can do (or not do) to get started on social media in the right direction. Hopefully these help you out.